A wide range of activities are planned to develop your child’s social, emotional, intellectual and physical development. The children work in groups or individually. In Nursery, for part of the session, the children are split into three groups and work at Small Group activities planned by the Teaching staff. The children are encouraged to become independent and select their own activities, plan their work with the aid of the staff and talk about their experiences. Termly updates are sent out to parents with more details of the curriculum being covered. 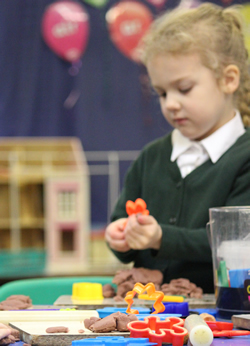 In Reception the children work towards achieving the Early Learning Goals in seven areas of learning. A progressive range of educational activities and experiences are provided that match the aims of the Early Learning Goals, support the meeting of the individual needs of your child, and help all children toward reaching their full potential. We encourage confidence and self-respect, enabling your child to establish effective relationships, while remaining sensitive to the needs and beliefs of others. We encourage children to express their feelings, share and take turns and to develop an understanding of what is right and wrong, and why. 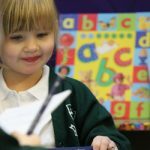 Developing a growing vocabulary, enables children to extend talking and listening skills, which then contributes to the development of early writing and reading. These goals focus on children developing physical control, mobility, awareness of space and manipulative skills in indoor and outdoor environments. 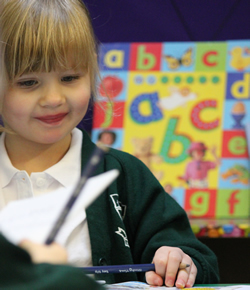 We help develop early writing and reading skills through planned activities, story reading and telling, labels and signs around the classroom and the teaching of phonics. 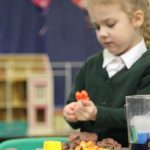 Through practical activities, children understand and record numbers, show an awareness of matching, sorting, sequencing and other mathematical operations and language. Children explore the natural and man made world, looking closely at similarities differences, pattern and changes. These goals focus on the development of children’s imagination and creativity and their ability to explore, express and share ideas and feelings through different forms of communication.